Yes, I am working but not for long. I am enjoying the day while trying not to ball out my nephew for not helping me with this Origami 6-Shelf thing. I originally set it up…. Two years ago. I want him to switch it from one wall to another, which is on the same wall as my computer desk. When you are single good help is hard to find. He has promised to move this thing now going on 8 months (for a year actually), and now I have a deadline. Columbus finally has an IKEA, and guess who is getting her Alex Drawers, her Kallax, and some storage containers? ME, that’s who. The moving of the shelf takes about 10-minutes, tops, and I need to finish this organizational job, so, I can get on with my life. I have a perfectly good Keurig coffee maker, mini-sized, as in big enough to hold a mug. I love my little machine, and I actually downsized from the 10-cup machine. It is only me, single in the house, and I had a kid, there is no way on this earth she would be drinking this stuff….at least not yet, LOL. I also love Starbucks, and I am constantly reloading the gift card. I have $4.50 left on this round. 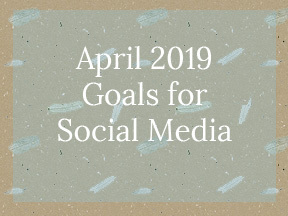 I often think about how much I spend on a cup of coffee, latte, or Frap, and when I really think about it, most of us who drink Starbucks (Dunkin Donuts, Tim Horton’s Cup O’ Joe…Et. all), could really feed a small country with our coffee drinking, would you agree? Thus, the reason for me buying the Keurig. So, I started wanting to learn how to deconstruct the coffee making process the Starbucks’ way. I cannot say I have it down to a science, but it at least makes tummy and brain happy. This is when I saw this International Delight commercial for making your own lattes at home. Apparently, they have been thinking about this too, or this would not have made it out of the gate. So, I am going to compare the traditional way with the cheat method, and then the Latte mixture. Traditional method does not work for me. Before I got my first Keurig, I had a Delonghi coffee system (not the original name, but I will go with that). It had on it a place where you can make regular coffee filter coffee, and fancy coffee (espressos, lattes, Macchiatos), you name it. To do that, you had the frothing stick, which in the 2 years I had it, I could not work this monstrosity of a machine. It was something that you put the milk in the cup, use this stick, to which steam came out to froth the milk, and you are supposed to end up with form. Not for me. It tasted horrible, and I hated it. This was the reason for me to start going to Starbucks. They were pros at this task. When I got the first Keurig, I poured in the milk and called it a latte. When I got the second one (a year before they came out with Keurig 2.0), I started using a method called, “Buy a can of Ready Whip and let it melt on top of coffee”. SUCCESS!!! I can now call myself a barista. If I want mocha, buy a can of chocolate Ready Whip, and I am in chocolate heaven. Why are you trying to ruin it for me? 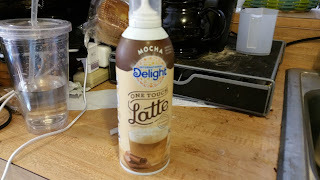 Apparently, International Delights must have been monitoring this ready whip stuff because two months ago, they came out with something called, “Latte in a can”, or One Touch Latte, So, last week, I bought a can. It costs me $3.79 at Market District, which is a high-end Giant Eagle. In fact, they do not want to be in the same league as Giant Eagle. Since this was a work-related buy, meaning that I bought it for the purpose of writing this review, I should get back the amount for a refund. Also, to give a little warning that this is not a sponsored review. I bought it on my own, thus I did not get a free can. · Leave room for froth. This means do not fill the cup all the way to the top. My suggestion is not put as much sugar in your coffee. This stuff is super sweet. Not recommended for diabetics or sugar sensitive people. · Shake it. Duh, otherwise, you would get milk (lot cheaper). · Press and hold about 5-7 inches from the cup. I also suggest you do not wear your nice clothes for this as it can get quite messy. It tastes good. Does it remind me of that little coffee shop that starts with an “S”, cost a lot of bucks for me to get a reloadable gift card, only for me to have change left on it? Nope, it does not even come close. Other thoughts that are colliding in my head over this product…. · Save your money. You can do better with a can of Ready Whip. · For the calorie counters out there…. 25 per 2 Tbsp or 120 per latte (1/7 of the can). I am trying to figure out which one is it. It is not your daily source of Calcium (0%), Vitamin D (0%), or Iron (0%). · Again, not for Diabetics and sugar sensitive people (17g of added sugar). · I got the Mocha, and there is also a Vanilla and Carmel Flavor as well. I will admit saying I was excited about trying this, being a coffee drinker, but it quickly fizzled the moment of usage. I keep talking about Ready Whip, which was meant for desserts, but I use it for my coffee when I want a latte. In comparison to One Touch Latte, I can see the application. I also see One Touch Latte being used like Ready Whip. It also depends on what you like. When I was little, you had coffee or you had tea in America. Lattes and expressos are European delicacies brought from the old country, Italians who wanted a little bit of “home” in a new world that the rest of us adapted to. Like sushi, I am glad it is here, but have to ask Starbucks why is it so expensive? One Phrase: Supply and Demand. There are none for today, except to the writers, you can do reviews without demanding pay in your post. Is it worth doing reviews? You bet, especially if you are doing a little PR work for a new client. Point the client to your reviews so they can get a little sample of your work. If the client likes the review structure and that is what they are looking for, they will hire you. In turn, it means work. June 2, 2017 Update: WTF? The stupid canister clogged on me. For $3.79, this thing is not allowed to clog. So, my overall impression of this product is like I said before: Get a can of Ready Whip. It is cheaper, and even if it clogs up, you feel better throwing away the can. Bye-bye glorified can of whip topping.